I like these on days when I have no time to put together a lunch for work or need something to eat while I’m in the car running errands. It’s quick to put together, covers my cravings for salty and crunchy, and has protein to keep me satisfied. They’re also a favorite for kids! As the weather outside gets nicer and it starts to warm up it’s got me looking towards the grill. I love a good burger! 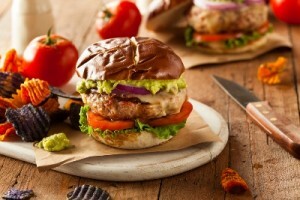 Some people shy away from turkey burgers, but do you want to know the secret? It’s what you put on or in the turkey that really makes a turkey burger great. Green chiles add so much flavor and just a touch of spice. Add in some avocados and pico de gallo or tomato and you’ve got an awesome burger. You can eat this burger on a bun just fine but I prefer to either eat it as a lettuce wrap or pop it on a plate with toppings and eat it with a fork to cut out the bread. Pizza is one of those foods I crave a lot but between the cheese, toppings, and carb filled crust I really have to be careful. When I discovered the fact that people stuff zucchini with all kinds of things I got a great idea… how about instead of crust I just use this healthy alternative? I can still add some melty cheese and a bunch of my favorite toppings!